If you’re a Seinfeld fan (and who isn’t!?) you’re going to love today’s post! A group of food bloggers and I have joined forces and recreated some recipes from our favorite food-centered Seinfeld episodes; be sure to scroll down and check out the other recipes and giveaways! Today we’re taking a break from all the Christmas celebrations to discuss an odd group of friends, a strange pole and a ‘show about nothing.’ And by now, all you Seinfeld fans are smiling. It’s been 15 years since the TV series left the air but it’s still very much around in syndication, popular culture and a little made-up holiday called Festivus. Celebrated with a bare pole and an airing of grievances, it’s a time to come together and say “I got a lot of problems with you people!” It’s all in good fun, of course, and in its 9 seasons, quite a lot of delicious food came up on the show. So some of my blogger friends and I decided to cook the foods best associated with the Seinfeld years and give away some great holiday gifts. Since I made pie from “The Pie” episode, I’ve included in the giveaway a set of pie cookbooks pictured below! I can’t stand people that ride their bicycles on the street when there is an obvious bike path! I can’t stand people that know I speak Spanish and say “Say something in Spanish”, like I’m an entertainment show. I can’t stand people that are picky. You have allergies, okay – you don’t like truffle fries? Have you ever HAD them?! I can’t stand people that bring burritos and tuna sandwiches into the airplane. Remember that episode when Jerry is pissed his girlfriend Audrey refuses to taste his apple pie by shaking her head and not even giving him a reason as to why she doesn’t want to taste it. All through the episode, Jerry becomes obsessed with the pie incident. Later on, they are having dinner at Poppy’s (Audrey’s family restaurant) and Jerry says Poppy not wash his hands in the bathroom, just before making pizza dough. Jerry now refuses to eat pizza by shaking his head, just like Audrey did. Jerry never finds out why she refused the apple pie. So I found it appropriate to make my version of apple pie, but instead of doing a double crust, I decided to top the pie with an oatmeal vanilla crumble – perfect way to add more flavor and texture. You can use the pie crust recipe I made for the Brown Butter Buttermilk Pie, or your favorite pie crust recipe. The classic apple pie with a crumbly topping of oatmeal and vanilla! Preheat oven to 350F and roll out pie dough. Set aside. Peel, core, and chop apples. Dump them into a bowl and mix with sugar, lemon zest, lemon juice, salt, and vanilla extract. Pour apples into unbaked pie crust. Make topping by stirring all the ingredients together. Sprinkle topping over apples. Bake pie for 45-50 minutes until apples are cooked all the way through. Serve either warm or cool. 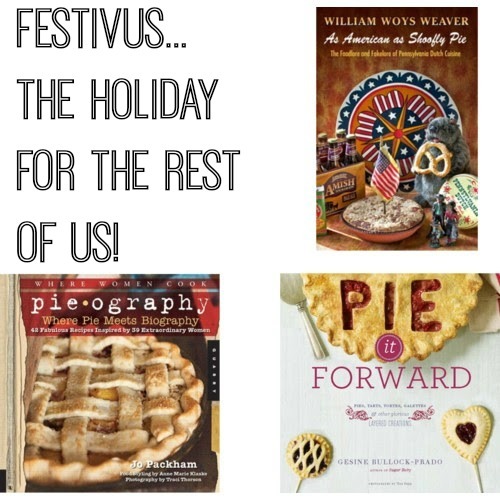 Be sure to check out the other blogs that are celebrating Festivus! And now, for the Festivus Giveaway! The Festivus giveaway includes 1 (one)- Seinfeld Complete Season DVD Box Set. 2 (two) 1.5 lb live lobsters from Lobster.com (These will be shipped overnight coordinated with the winner) 1 (one) – 10 piece Kenmore nonstick cookware set. 1 (one) – King Arthur Flour Baking Set. 1 (one) – Wilton Bake Pan Set. 1 (one) – OXO Salad Kit. 1 (one) – OXO Baking Set. 1 (one) – Soup Maker Cookbook and 1 (one) – Pie Making Cookbook Set. ONE WINNER PER PRIZE. 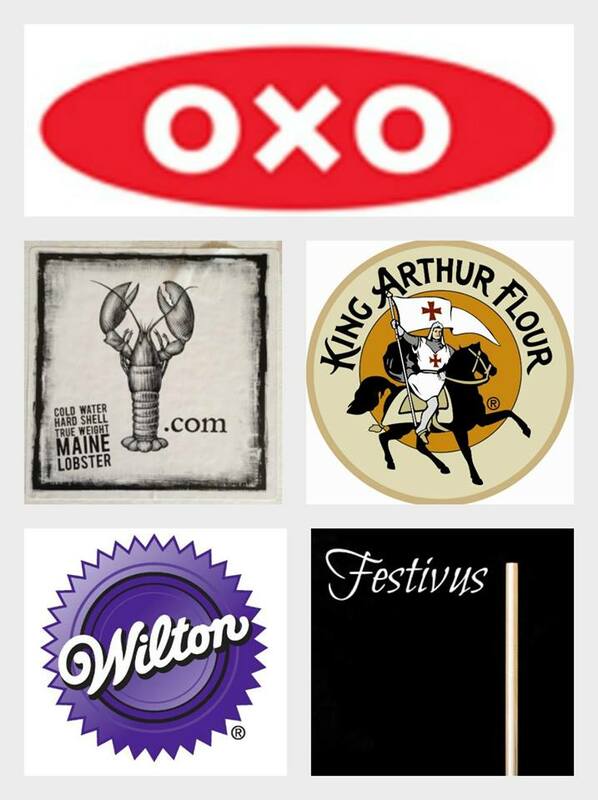 Disclaimer: Prizes were sponsored by King Arthur Flour, OXO, Lobster.com, Wilton plus members of the Festivus blog group. This pie is fantastic I love the crumble you used in place of the crust, so good! On Thursday, my husband went to pick-up my son’s prescriptions from the Pharmacy (which is 30 miles from our home). When he got home, he realized they only gave us one of the medications–not both of them! Another one involving my husband: he participated in a charity auction at his work (employer will remain nameless for now) where he had the winning bid for two tickets to a University of Oregon Duck basketball game (my son is a fan–the rest of us cheer for the OSU Beavers), which were valued at $66 (so, he bid accordingly). When he received the tickets, it was two General Admission tickets valued at $8 each! Sure hope the money he donated was for a good cause! I hate when the people drive sooo sloooow here in Fl. My grievance is people who don’t say thank-you (verbally, email, note) for gifts. People driving TOO slow in the snow is the most recent grievance I can think of This round-up is SIMPLY BRILLIANT! 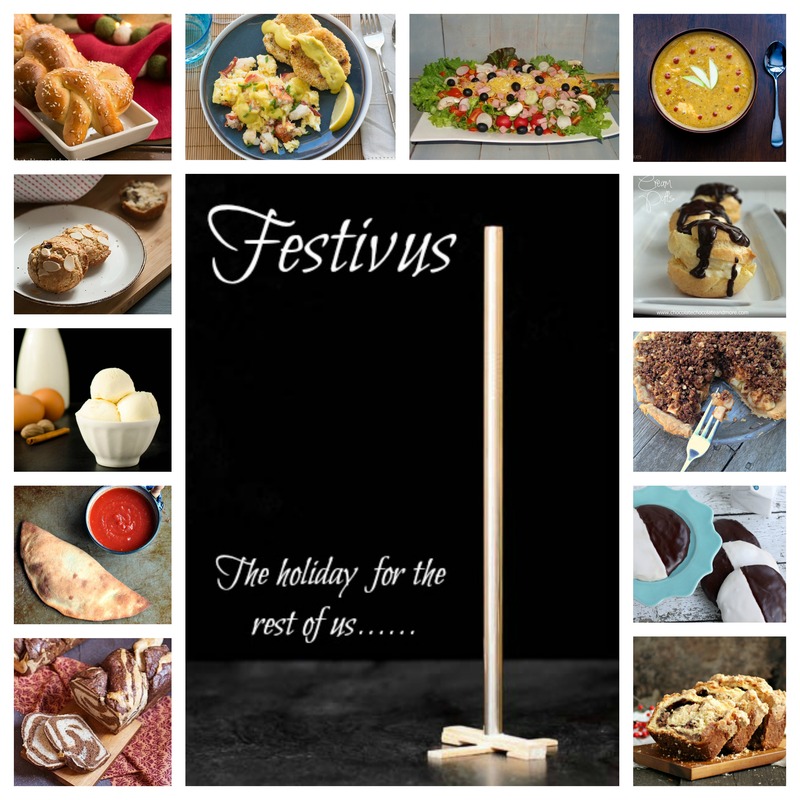 Can’t wait to read everyone of these posts – happy Festivus! I just can’t relate to people who refuse to taste pie. I’d taste your pie to the point where there would be nothing left of it. Stupid drivers! It seems to be so much worse lately. When people don’t say thank you!! Makes me crazy! I would never turn a slice of your pie down, especially with that oat crust on top, it’s better than double crust! When I aired my bicycle grievance I should have added the people who ride on the sidewalk too, it drives me crazy! I hate how people think they can drive twice as fast when it snows…you might be from the North, but that doesn’t mean you know how to drive in 10″ of snow!! Okay, back up the truck, people bring burritos on a plane? That’s so weird. I’m with you on all your grievances, although I am picky. But I do try everything, unless I’m allergic. Then not so much. And thanks to you I now I want pie and truffles fries. Ha. I love this pie recipe. We’re huge apple pie lovers here. My daughter goes wacky for them. It’s her fave. Nothing better than apple pie, unless there is oatmeal on top! YUM! thanks so much for participating and bringing such a lovely dish. I had such fun doing this giveaway and you made my first time a great experience! My favorite restaurant back home just shut down! What the heck…that’s my grievance. I have a coworker who complains about other coworkers habits but doesn’t’ realize that she has the same annoying habits!! I hate it when people feel a need to always one-up. Okay, you made chocolate chip cookies when you were nine months old… good for you. Mine still taste better. Second – my grievance is very NYC related but I hate when people wear giant backpacks or carry giant bags on the subway. Put your bag on the ground so you don’t smack me with it with every tiny move! Ok, my grievance is somewhat related to your #2: I hate it when people find out that I speak Spanish and feel compelled to inform me that they took Spanish in high school and don’t remember a thing. Am I supposed to absolve them? Feel pity for the hours they wasted in class? I’m gonna start saying: “Yeah, I don’t remember anything from chem class either, I know what you mean.” 😛 ROFL! I love the pie, I love the grievances and I love that you participated in this with us!! Thank you so much for joining in! And thank you so much for donating one of the prizes – the books look insanely amazing!!! You rock! This would be a perfect dessert for me to bring to our Christmas dinner – looks delicious! OMG look at that wonderful crumb topping on the pie! You are after my crumb loving heart and tummy with this one. Yum! I’m new to Madison and some of the drivers here are crazy. . they do the cut you off and slow down thing. . which, in the snow, is freaking dangerous! and wow! does one person win everything?!!! happy holidays!